One. Centenarian Ted Broostad, one of Calgary’s oldest seniors, was born in Saskatchewan. 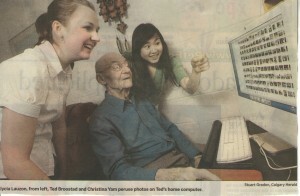 Ted celebrated his 100th birthday, now embraces cyber world. To see this energetic and vibrant great-great grandfather on the go, you would never believe he is that old. Look at his photo to yourselves. Two. There’s a new theatre company in town – The Calgary Russian Theatre Foundation. They are staging Marc Camoletti’s “Pyjamas for Six”, a sequel to the play Boeing-Boeing, which Stage West recently produced. The show will be in Russian, but with a simultaneous English translation for one performance to-day on the April the tenth. It will run tomorrow either at Mount Royal University’s Wright Theatre. The play, directed by Val Pashchuk, is the stuff of traditional farce. Three. Gas and Light Productions ends its season with two short comedies by famous British playwright Tom Stoppard: “The Real Inspector Hound and After Magritte”. Director Jeremy Mackenzie says: “The Real Inspector Hound”, a play-within-a-play, is Stoppard’s attack on Agatha Christie’s murder mysteries and theatre critics. The shows run until April 17th in the Joyce Doolittle Theatre. Five. Sunflower seeds are a good source of pantothenic acid, also known as vitamin B5, a water soluble vitamin the body uses to make bile, hormone, red blood cells and vitamin D.